BestBottles.com offers an exclusive selection of perfume atomizers. The terms atomizers and sprayers are used interchangeably in this section. To learn more about our various atomizers and sprayers please click on the links below. To order the perfume atomizers, please use the links on the left hand side. We offer a great selection high quality refillable perfume atomizers in 5ml (1/6oz), and 10ml (1/3oz) sizes. These travel size atomizers are easy to fill and easy to use. You can refill your fragrances from larger bottles into these convenient size bottles for traveling. They also make great gifts, party and wedding favors, and promotional items for launching new fragrances. These high quality, elegant atomizers are used by large high end retailers, fragrance manufacturers and promotional companies to promote their new fragrances or give as gifts. To fill the perfume atomizer please follow the steps described below. Pull off the bottom metal shell. Inside the bottom metal shell is a glass bottle that is screwed onto the spray top. Unscrew the glass bottle from the sprayer. Fit the bottom metal shell back onto the sprayer. The 10ml size atomizers are available in various colors such as Black, Blue, Gold, Green, Lavender, Pink, Red, and Silver. Atomizers with special decorative effects are also available. These include Silver with silver dots, Black with silver dots and silver with gold hearts. The 5ml size atomizers are available in various colors such as Black, Gold, Red, and Silver. Atomizers with special decorative effects are also available. These include Silver with silver dots, Black with silver dots and Pink with silver dots. Glass bottles with atomizer (sprayers) are a cost effective alternative to the metal shell atomizers. The glass bottle atomizers are also available in 5ml (1/6oz), and 10ml (1/3oz) sizes. These travel size atomizers are easy to fill and easy to use. You can refill your fragrances from larger bottles into these convenient size bottles for traveling. The glass bottle atomizers make excellent cost effective gifts, party and wedding favors, and promotional items for launching new fragrances. To fill the glass bottle atomizers please follow the steps described below. Unscrew the fine mist spray top. Fill the glass bottle with your fragrance. Screw the fine mist spray top back onto the glass bottle. The 10ml size glass bottles are available in clear glass, clear glass with swirl design, clear frosted glass. The 5ml glass bottles, at present, are available only in clear glass. The metallic collars on the fine mist spray pumps for the 10ml glass bottles are available in different colors such as Black, Turquoise Blue, matte Gold, Red, shiny Silver, and matte Silver. The metallic collars on the fine mist spray pumps for the 5ml glass bottles are available in different colors such as Black, Turquoise Blue, matte Gold, shiny Silver, and matte Silver. The spray pumps for both the 5ml and 10ml bottles have a clear plastic cap that fits over the spray pump. The brushed aluminum refillable spray bottles are an attractive solution for applications that require a large capacity spray bottle. These bottles come in two sizes, 125ml (4 oz) and 250ml (8oz) capacity. The fine mist spray top is made of black colored plastic. A clear plastic cap fits over the spray top. 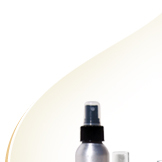 Plastic bottles with fine mist sprayers are ideal for applications that require light weight and non-breakable bottles. 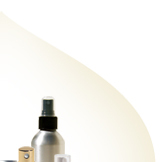 The 1oz capacity PET plastic bottle comes with a matte silver metal collar fine mist sprayer. The bottle is refillable and easy to carry around and use. Classic style perfume bottles with straight edges and sleek looks have always been popular. Our selection includes a number of classic design bottles with a various color spray tops, such as Black, Gold, shiny Silver and Matt Silver. The sprayers can be unscrewed for refilling the bottles. Bottle capacities range from 15ml (1/2 oz) to 3 ½ oz. Make your product stand out by using Antique Bulb style sprayer bottles. The bulb atomizers give a timeless elegant look. The bulb atomizers are available in two styles, with and without tassels. Bulb atomizers are available in Black, Gold, Pink, Lavender and Beige colors. Various style bottles are available that fit out bulb atomizers.